Essential oils, God’s medicine (? ), if you ask me, yes! If you know me, then you know that I don’t leave the house without a couple bottles jingling around in my purse. Rarely can you travel with me without being fully exposed to a variety of these liquid jewels. My sister thought I would get us promptly removed from the airplane the last time we flew together. You know, just a little misting of thieves (wink, wink) (Oh yeah and I’ll tell you about Thieves Oil later). Germ killing, odor eliminating, virus stopping, sinus relieving, sleep inducing…essential oils, who WOULD be caught without them? This passage became a healing balm to this worried momma and soon, as the realization that I was treating my children under the direction of The Great Physician drizzled into my heart and mind, my fear dissipated. I hated using “drugs” on the kids so any time the boys were sick I would search for natural medicines that could take the place of pharmaceuticals. Occasionally I had used essential oils for scenting my homemade soaps and lotions, but had never heard or read about using them medicinally until a friend and I stumbled into an introductory class on pure essential oils a few years ago. It took me about 2 minutes to know that this is what I had been in search of for decades. All of those over the counter, natural alternatives to conventional medicines were a good replacement, but these oils (I just knew) were God’s answer for me. I honestly don’t remember a lot of what the presenter said that day, but all I could think was,”I gotta get me some of these!”. If you haven’t heard of essential oils, please forgive my delay in explaining them. The Merriam-Webster definition is: any of a large class of volatile odoriferous oils of vegetable origin that give plants their characteristic odors and often other properties, that are obtained from various parts of the plants (as flowers, leaves, or bark) by steam distillation, expression, or extraction, that are usually mixtures of compounds (as aldehydes or esters), and that are used often in the form of essences in perfumes, flavorings, and pharmaceutical preparations. That pretty much sums it up! However, the definition doesn’t even begin to explain the range of use for essential oils. As this is only an introductory post regarding oils, I will be sure to share how and when to use them in future posts, but I can’t leave you without sharing that God knew we needed essential oils. I have read that there are over 500 references to essential oils in the Bible. One specific incidence is when God gave Moses a recipe for very special anointing oil in Exodus 30:22-30. The oils that God includes in this recipe, we now know, are anti-bacterial, anti-viral, anti-infectious, anti-parasitic, anti-inflammatory, antiseptic, anti-fungal, aid in respiratory and skin disorders,…this list is too extensive to continue here, but you get the idea. Do you think it was an accident that God wanted everything in the temple (including the priests) that came in contact with sacrificed animals to be covered with this very specific recipe? Do you think it was just so everything smelled nice? I doubt it. God had a pretty good reason for everything. I’m still learning about essential oils and the many ways they can be used, but so far we use them for protection against viruses and bacterial infections, as an antiseptic on wounds, bites and burns, for elimination of lice, for skin care products like moisturizer and acne treatment, oral care, food seasoning, treatment of illnesses, fever, sore throat, digestive issues, PMS, sinus infections, allergies, insomnia…well, as you can see, just about everything. The more I learn, the more convinced I am that God provided us with the ultimate first aid and medicine cabinet. Hopefully as I share with you, you will be convinced as well. Just a quick word of caution, there are many essential oils on the market that are NOT pure even though the label may say so. Using adulterated essential oils can actually be detrimental to your health so I will list a few trusted resources below. www.edensgarden.com This is my favorite. 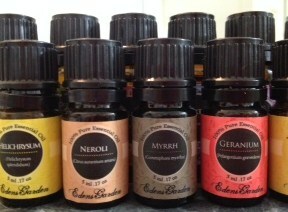 I have used their oils for a couple of years (internally and externally). There is no middle man, meaning they do not even sell to stores. A Christian company that even has months where they give a percentage of profits to Christian Charities like Teen Challenge. www.beeyoutiful.com My friend from www.sacredmommyhood.com uses and recommended this company for quality oils at a good price as well. www.youngliving.com This is multi-level marketing company. I love their oils but they are pricey because of the structure of the company. Of course you receive a lot of free training and information regarding the use of oils when you sign up to order their oils.